This information came from some sporadic correspondence, between 2005 and 2008, with a contact made through Genes Reunited. According to this source, Tryphena was the daughter of John Bull (a grocer) and Mary Osborn of Brackley, Northamptonshire, making her my great grand aunt and my mum’s grand aunt. Is this true? A quick check at FreeBMD confirms that a marriage did occur between these two people (Oct-Dec 1874 quarter, Pancras registration district, vol 1a, page 46). Pancras is in London, so there does not seem to be a connection to Brackley. From Typhena’s age on census records (1881-1911) after her marriage, I conclude the likely a date of birth is 1843, with a range between 1843 and 1846. These records contain no information about her parentage, but earlier censuses should. I found 3 Tryphena Bulls in 1871. One was married and one was too young, leaving just one possible Tryphena, born ca 1848 in Northamptonshire, a servant to George Knapp in St Clement, Oxford. Well that is closer to Brackley, but still provides no information on Tryphena’s parentage. The 1861 census does contain evidence that Mary Bull, a retired grocer’s wife, was Tryphena’s mother, but it may not be simple to find this record. What does Tryphena Robbins [Tryphena Bull] mean? Ancestry users can submit corrections and alternative interpretations that may be added to the index. Such additions are enclosed in square brackets. In this case, the addition is helpful and made it easy to find this record. The same search on findmypast yielded no results. So, how does this compare with the census page? The transcript incorrectly combines two households. 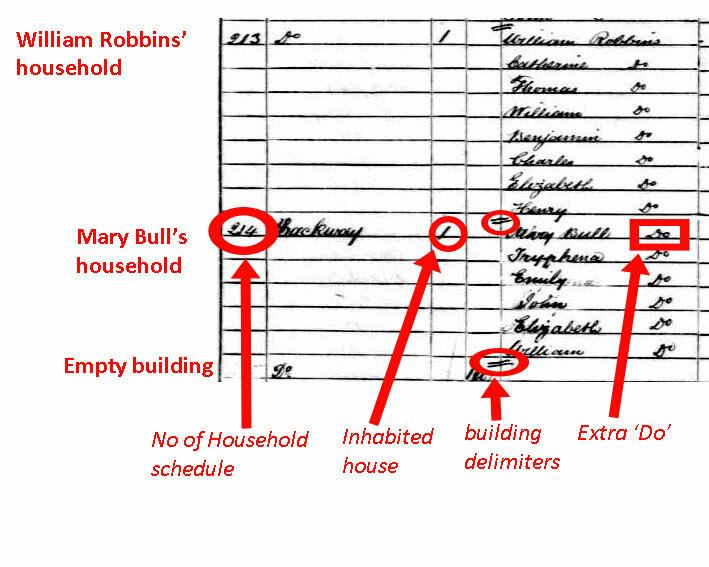 The ‘No of schedule’ and ‘Inhabited house’ entries and building delimiters indicate that Mary Bull’s household is in a separate building from William Robbins’ household. The ‘Do’ next to the name Mary Bull indicates repetition of the surname above, so the index rendering of the name as Mary Bull Robbins is strictly correct. However, I believe this an error made by the census enumerator as dittos are usually restricted to within a household. It is important that indexes accurately reflect the original records including errors, but interpretive additions are useful. Given the index issues with this census household, how should I cite the record so that you do not have to rely on searching an index, can find an image on an alternative website, microfilm and the original? Census. 1861. England, Northamptonshire, Brackley St Peter, Enumeration District 3, image no 32; schedule 214. Digital image. Ancestry (www.ancestry.co.uk : accessed 14 November 2012); citing The National Archives, Kew, RG 9/921, folio 51, p. 31. The county, civil parish, enumeration district and image number is the information needed to access census pages by browsing the census collection in Ancestry’s Card Catalogue. The National Archives reference reflects the archival arrangement of the original records at Kew. It is used for microfilm copies, so many citations from the pre-internet era are in this form. Findmypast’s Census Reference Search uses the TNA reference, providing a direct route to the census page. I like Ancestry’s browsing capabilities, because it allows me to easily examine the context and sometimes no index can make sense of the records. I prefer Findmypast’s reference search because it is consistent with well established British citation practice and quicker. I would like all of the elements of the citation to be embedded in the digital images I download in a form that could be read by my genealogy software. That would make keeping track of my sources much easier. London parish register entries are available on Ancestry, so you can access the marriage certificate for Tryphena Bull and James Valentine Wellstood without having to pay £9.25 for the official copy from the GRO. The link to the record on the Ancestry website is: http://goo.gl/Px1Ks. You will see that Tryphena’s father is given as John Bull, grocer, and that one of the two witnesses to the marriage is Mary Bull, so it looks like she is from your family. The Tryphena Bull who appears in the 1871 census in the household of George H Knapp in Oxford was a lady’s maid. A lady’s maid was a personal servant who would have travelled with her mistress wherever she went, so she could easily have spent time in London. Tryphena would presumably have worked for one (or both) of George’s two sisters who were in his household in the census – Elizabeth and Clara. The Knapps were a wealthy family – you can read more about them at http://goo.gl/XfD58. Thank you, Caroline. The other witness also fits with Hirons-Bull connections. It is a pity more archives do not make thier records available in this way, kudos to London Metropolitan Archives. The Headington website also has other information relevant to this family, bookmarked for reference! Other archives do make their records available. Medway Archives in Kent (cityark.medway.gov.uk) has made their parish register holdings available to all comers, not just Ancestry subscribers. They used a grant from the National Lottery (best use of lottery money ever). Also, Canterbury Cathedral Archives has made many of their parish registers available on FindMyPast under the Special Collections heading. Unfortunately, neither of these has any index and so it’s browse, browse, browse. Thanks for the Medway and Canterbury Cathedral update. So far development of online provision for English parish registers has been very piecemeal. I would like all the English parish registers to be indexed and linked to images of the original registers and in one place like the Scottish records at ScotlandsPeople. It would be nice if the records were free, like Familysearch or local archive offerings, but I would not be averse to paying for quality transcripts and search tools. Having looked at the Medway website, I was not very impressed with the website itself, because if you zoom out the see the whole image, the links to the next page become microscopic. At best the website is in early development and its usability and functionality do not compare with Ancestry, FindMyPast or FamilySearch. I wonder if the archive considers the online provision of these records as ‘done’. It appears that the project only involved scanning the records, which is only the first step in making the records truly accessible to all. If the Heritage Lottery funds only covered scanning, I think it is scandalous that there was not more joined up thinking, as the result is nowhere near as effective as it should be.